After World War II, the story goes, the United States parted ways with its isolationist past and asserted itself as a political and military power. Recently, though, historians and political scientists have begun to question this narrative, concluding that the United States sought to avoid political and military commitments to Europe for much longer than had previously been thought. Political scientists have, however, yet to offer a compelling explanation for American behavior. Enter Brendan Green, who provides a theory of Cold-War American foreign policy in his important new article, “Two Concepts of Liberty: U.S. Cold War Grand Strategies and the Liberal Tradition.” Green argues that the Cold War world presented the United States with “two strategic options: buck-passing or balancing” (p. 11). Buck-passers tried to get others to take on international burdens; balancers directly engaged and sought to manage those burdens. Which option the United States pursued depended on the dominant concept of liberty within the presidential administration (9-10). In particular, the shift from the ‘negative’ concept of liberty during the Dwight D. Eisenhower administration to the ‘positive’ concept under John F. Kennedy explains the major change from buck-passing to balancing in U.S. foreign policy. Though Green does not identify it as such, there is a strong case to make that the theory’s use of structural constraints and domestic ideas place it within the neoclassical realist tradition. Green begins by outlining his two concepts of liberty. All liberal elites seek “the promotion of democracy, free trade, and basic international laws and rules” (11). This shared belief does not lead to uniform policy prescriptions, however. Negative liberals conceive of freedom as the absence of external constraints and are skeptical of state power. By contrast, positive liberals argue that freedom requires the ability to take actions. These variants translate into discrete foreign policy preferences. For negative liberals, an activist foreign policy can enlarge the state and undermine freedom at home. They therefore prefer an exemplarist foreign policy “with lower costs at home and fewer commitments abroad” (14). Positive liberals are much more willing to pursue a crusading foreign policy, seeking “to use strategic commitments to foster global liberty” (15). The article relies on two types of evidence to make its case. The first is a correlation between the President’s views of liberty in domestic politics and the foreign policy choice. Green codes Eisenhower’s and Kennedy’s views by examining their statements on the role of government in domestic politics before taking office. In this way he avoids mistaking post hoc justifications of foreign policy decisions for underlying beliefs. The second is the particular liberal motivation driving each strategy (16-17, 23). To trace these processes Green makes extensive use of archival records. Eisenhower’s negative liberal beliefs found expression in his desire to build Europe as a ‘third force’ (23-31). In doing so he believed that he could reduce the burden to the state. He therefore encouraged European integration, supported sharing nuclear capabilities, and sought to construct an independent European nuclear deterrent with the Multilateral Force (MLF). His decision to stand firm in the Berlin Crisis in 1958 stemmed from fears that losing Berlin might result in losing Europe, which would have forced the United States to “be reduced to the character of a garrison state if it was to survive at all” (30). At home Eisenhower emphasized nuclear deterrence in order limit government’s growth. Kennedy ushered in an era of positive liberty, the result of which was a commitment to balancing against the Soviet Union and managing Western Europe to ensure liberal political stability (31-37). To that end, the administration put an end to any notions of Europe as a ‘third force,’ centralized nuclear policy with flexible response, privately killed the MLF, and committed to keeping troops in Europe “as long as they are required” (32). They also pushed for Britain to join the European Economic Community in order to exert greater U.S. influence and bolster liberal regimes. Green cautions the reader that his argument extends only to the geopolitical core in bipolarity (11). The first scope condition is not particularly limiting. As Kennedy’s Secretary of State Dean Rusk pointed out, “Europeans were not innocent bystanders in the Cold War. They were the issue. The United States was not going to fight the Soviet Union about polar bears in the Arctic; it would go to war over Europe.” The second scope condition restricting the argument to bipolarity is also reasonable, if somewhat more limiting. Readers will no doubt wonder about the potential implications for contemporary foreign policy debates (to the extent there is a debate in Washington). Green does briefly speculate on such implications at the end of his article, but in future discussions it would be helpful if he parsed out when and why other variables trump the dominant concept of liberty in determining foreign policy. Even with these scope conditions, Green’s argument takes on an impressive array of theories. His careful use of history casts doubt on theories that claim the United States quickly and decisively committed to Europe after the Second World War. The U.S. was less eager to construct institutions, less sensitive to apparent interwar lessons which stressed the need for U.S. leadership, and less willing to pursue hegemony than many liberal, constructivist, and hybrid explanations assert. He tackles the difficult challenge of measuring the impact of ideas on foreign policies in a rigorous way. In doing so he moves beyond arguments that simply posit that democracies or liberal regimes have particular foreign policy tendencies; there can be important variations within a single ideological landscape. In addition, he carefully considers three alternative explanations – changes in the nuclear balance, changes in political party, and the claim that there was constant balancing – and shows that none adequately explain the historical record. The implications for buck-passing and bipolarity in realist thought are equally interesting. There is little understanding of buck-passing in bipolarity, in part because many consider it a multipolar phenomenon. “No buck-passing takes place among the great powers in bipolarity because there is no third party to catch the buck,” John Mearsheimer writes. The lack of the buck-passing option is in turn one of the pillars for the neorealist claim of greater stability in bipolar than multipolar worlds. Despite the article’s many merits, several puzzles remain. First, there are reasons to doubt the strength of the correlation between the concept of liberty and foreign policy choices for Europe. As Green points out, the Harry S. Truman administration was generally reluctant to commit to Europe (38). One could also point to Ronald Reagan’s embrace of a strong U.S. defense posture and an active European role. In both cases the President’s domestic beliefs do not seem to have resulted in the predicted foreign policy behavior. Second, the shift from buck-passing to balancing may have been more gradual than Green allows. This was particularly true with respect to military policy. Kennedy did elect to prevent Germany from acquiring nuclear weapons. But he was willing to aid the British and French programs so that those nations might become, along with the United States, “joint defenders of Europe.” Like Eisenhower, Kennedy had a healthy skepticism that a nuclear war could be fought in a controlled manner; his administration’s basic nuclear war plans undercut the idea of flexible response by offering only superficial changes to those of the Eisenhower period. Moreover, Kennedy inherited six army divisions in Europe and did not budget for increased forces. Rather, Kennedy seemed willing to reduce costs by decreasing the American presence. “We cannot continue to pay for the military protection of Europe while the NATO states are not paying for their fair share and living off the ‘fat of the land,’” he told the NSC in 1963. Finally, there is some evidence that it was not until the Richard M. Nixon administration that the United States finally committed to a permanent ground presence on the continent. In the end, the strengths of the article greatly outweigh its limitations. “Two Concepts of Liberty” shows the importance of accounting for variations within liberalism when explaining foreign policy. In doing so, it provides the first compelling theory to account for the allure of buck-passing as grand strategy during the early Cold War. Paul Avey is a Fellow at the Belfer Center for Science and International Affairs at Harvard University and a Ph.D. candidate at the University of Notre Dame. He is the author of “Confronting Soviet Power: U.S. Policy during the Early Cold War,” International Security (Spring 2012), and is currently completing his dissertation manuscript on conventional conflict in asymmetric nuclear balances. See note 1 in Green, “Two Concepts of Liberty,” 9. See note 2 in Green, “Two Concepts of Liberty,” 9-10. 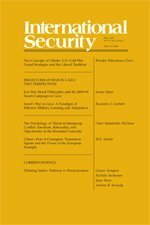 In addition, see Sebastian Rosato, “Europe’s Troubles: Power Politics and the State of the European Project,” International Security 35:4 (Spring 2011), 58-59. Gideon Rose, “Neoclassical Realism and Theories of Foreign Policy,” World Politics 51:1 (October 1998). Quoted in Thomas Alan Schwartz, Lyndon Johnson and Europe: In the Shadow of Vietnam, (Cambridge, MA: Harvard University Press, 2003), 5. John J. Mearsheimer, The Tragedy of Great Power Politics, (New York: W.W. Norton, 2001), 270. See also ibid., chapters 8-9; Kenneth N. Waltz, Theory of International Politics, (Reading, MA: Addison-Wesley, 1979), pp. 67 and chapter 8; and Thomas J. Christensen and Jack Snyder, “Chain gangs and passed bucks: predicting alliance patterns in multipolarity,” International Organization 44: 2 (Spring 1990). Marc Trachtenberg, A Constructed Peace: The Making of the European Settlement, 1945-1963, (Princeton, NJ: Princeton University Press, 1999), 355-367, quote at 365; and Francis J. Gavin, Nuclear Statecraft: History and Strategy in America’s Atomic Age, (Ithaca, NY: Cornell University Press, 2012), 38-39. Gavin, Nuclear Statecraft, chapter 2, quote at 42. Hubert Zimmerman, “The Improbable Permanence of a Commitment: America’s Troop Presence in Europe during the Cold War,” Journal of Cold War Studies 11: 1 (Winter 2009).